ADERO NEELY: BIO & PROFILE Adero means "Gives Life". Referred to as "boy Wonder" by Chicago media, 14-Year Old Adero is Chicago's 2006 Most Talented Kid. At 12, Adero is a national opening act for major superstar acts and his songs are getting radio airplay on Chicago's Power 92 and WGCI FM. In 2007, Adero performed in New Orleans, Houston Texas and Springfield Illinois. Adero was featured by the Chicago Football Classics as its 2007 showcase artist. Adero's acting credits include the character of "Little Tony", the son of Malik Yoba, in the controversial hit stage play "Work It Out", which premiered at Chicago's Arie Crown Theatre, and the character of "Travis Younger" in the Off Broadway musical Raisin, an adaptation of Raisin in the Sun at the University of Chicago's Court Theatre. Adero completed a national Sears commerical and will appeared in the 2007 short film, "Hollywood Jerome" by Fred Hoffman & Malik Yusef. Adero is the poster child for the Big Brother's program. Adero won his first national singing competition at 10-years-old beating out over 150 adults and becoming Kalahari Resorts (Wis) first 2004 Idol. Adero appeared in Word Up Magazine at 11-years old, Gumbo Magazine at 12-years-old and Hip Hop Teen Magazine in May 2007 at 13-years-old. The Chicago Defender Newspaper referred to Adero as the "Kid With the Platinum Voice". Adero's 2005 music video 'Save Some World for Me' was selected by Swept Away TV, a nationally distributed teen music/pop culture TV show seen in 42 markets including NYC, Philadelphia, Miami, Atlanta and Phoenix and is estimated to be available in 19 million households. UNSIGNED Music Magazine and KCSG television also accepted Adero’s music video for their music television show that broadcast to over 150,000 homes via cable and 500,000 via the Dish Network. Adero's new music video will air on Germany’s TV-38, Australia’s TV-31, Channel 25.com Time Warner Cable TV in Manhattan NY and Cablevision in Long Island NY. Additionally, National Independent Music Video Show selected Adero’s music video as one of the best Indie Music Videos to round out their first season of IM, a nationally syndicated TV show sponsored by Sam Ash Music & CD Baby. With respect to radio, Strictly Vegas Internet Radio and Indie 104.7 FM, iRadio LA placed Adero’s song, “Save Some World for Me' in rotation and many college stations are following suit. Adero was the opening act for a sell out crowd of 4,500 at the 2006 'New Jack Tour' in the Arie Crown Theater featuring R&B singers Aaron Hall, Guy, Teddy Riley, Black Street, Tony Toni Tone and After 7. Adero also opened for the Whispers in Orlando, Fla. and KoKo Taylor at the Trump Majestic Star Casino in Buffington Harbor Indiana. Adero can be visited at www.aderoneely.com, www.myspace.com/aderoneely and his music is available for purchase on itunes. 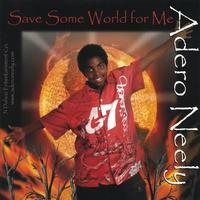 On "Save Some World for Me", Adero Neely shows his vocal skills despite his young age. This young man is proving that his voice will be in the ears of many in the near future. His voice is powerful and his melodies are beautiful. Adero belts out influential and impressive vocals on his a Capella track "Save Some World for Me". If you like the Jackson Five then you will love Adero Neely. Don't miss out on this rising star, get your copy today!